As I wandered around the kalyANa mantapam (festivity venue) at Chromepet, it struck me that there are so many trees that are inextricably entwined with Hindu rituals and customs…and I was lucky to be able to photograph some of them, right there. I am giving the Tamizh names and the link to the Wikipaedia entries about them, too. 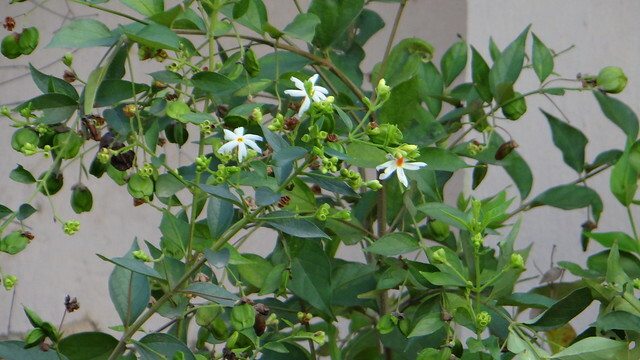 pArijAtha or “pavazha malli” (literally, “coral jasmine” maram (maram is tree is Tamizh). 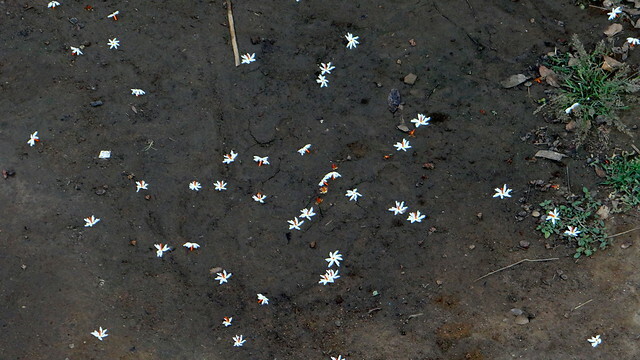 The flowers of this small tree are very beautiful: They fall like stars to the ground, where they are gathered up for worship by devout Hindus in the morning. Though the wiki entry mentions the mythology of the tree being the focus of a tussle between Rukmani and Sathyabhama, two of Krishna's beloved, there is a story about Hanuman having his abode amongst the roots of this tree: "AnjanEyam athi pAtalAnanam/ kAnchanAdri kamanIya vigraham/ pArijAtha tharu mUla vAsinam/ bhAvayAmi bhava mAna nandanam". My parents had a huge tree in the garden, and I would gather the flowers, distribute them amongst our neighbours, and take some to the nearby "vyAyAm ghar" (exercise place) where there was an image of Hanuman, and offer them there. My practice of reciting the Anjaneya Ashtothram (108 names of Hanuman) dates from the time I was 14 or 15...and in spite of my agnosticism, it's something I never fail to do, till date! Another tree that was common in gardens of temples is the Vilva maram The fruit of the tree is used for both food and medicine, even today. In folklore, the tri-foliate form of leaves symbolize the trident that Shiva holds in his right hand. 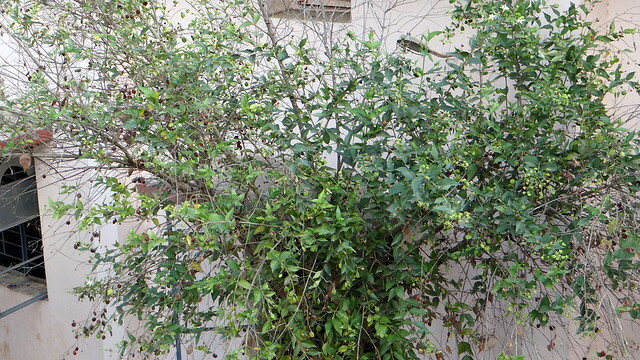 The third tree, that is used everywhere in Hindu rites and rituals, is the Every part of the tree is useful; the stem is used as a vegetable (yes, I cook it, too, and it's one of my daughter's favourite vegetables!) 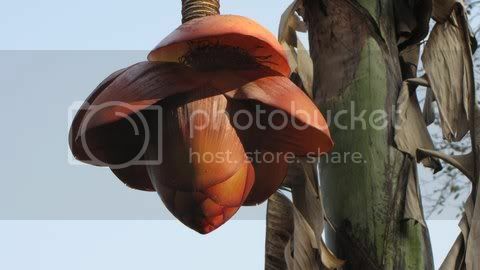 as is the raw fruit; the flowers are also cooked; the "petals" of the banana flower were often used as informal containers during meals; the leaves are an essential part of the south Indian feast...an "elai shAppAdu" (leaf meal) is a must, where the food is served on plantain leaves, with the "nuNi" (tip of the leaf) intact. (The leaf-tip must face to the left, I don't know why that rule!) The banana stems are chopped, and the mantapam entrance is decorated with the leaves and the banana flower forming a graceful arch of welcome for the guests. Many of our dishes are also cooked or steamed in banana leaves, which form a great traditional lining. Even today, I enjoy unwrapping the spiral of banana leaf which encloses the "kadubu", a Kannada dish somewhat like an iddli. 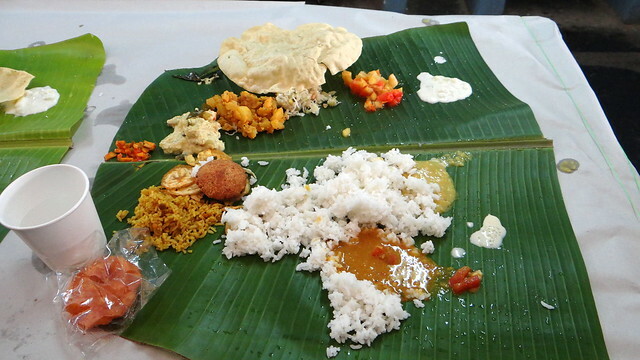 Kerala dishes made with jackfruit and rice flour are also steamed in plantain leaves. I photographed a very huge variety of this plant at Lalbagh, on 080211: The plant was mis-labelled as "Crown of Thorns", though. 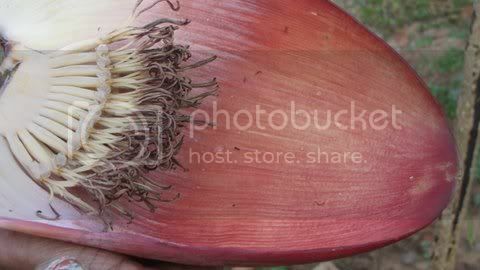 I also clicked the stamens, which are cooked after the pistils are carefully removed: In Coorg tradition, the bridegroom chops down several banana stems in symbolism for wild animals, to show his manly prowess. 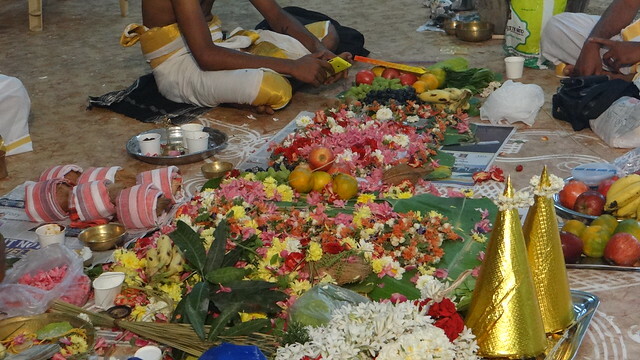 In Tamil Nadu, we sometimes had young women married to symbolic banana stems when the grooms could not be physically present. No, I refuse to go further with the banana symbolism! 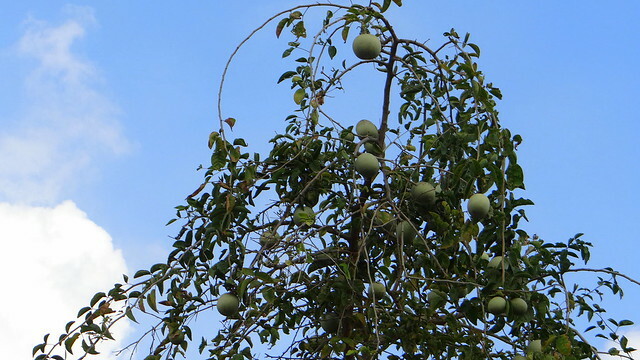 Another tree that is always associated with Hindu rites is the mA maram (mango tree). The mango is considered the king of fruits in India, and the wood is used for cheap furniture; the leaves are an essential part of the "thOraNam" decorating doorways to homes, and the fruit, in its baby (mAvadu) and raw (mAngAi) forms are used in making delicious pickles. I won't write much about the Coconut palm...thennai maram ...as it is so ubiquitous! 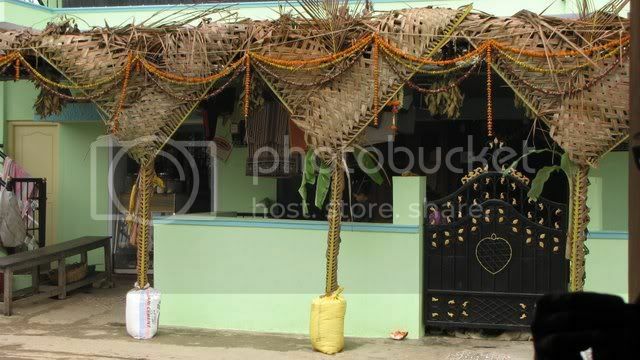 You can see how palm fronds are used for decoration: In this pic you can see coconuts rolled up in dhotis, to be gifted to the priests: We cannot do without coconuts for any puja! 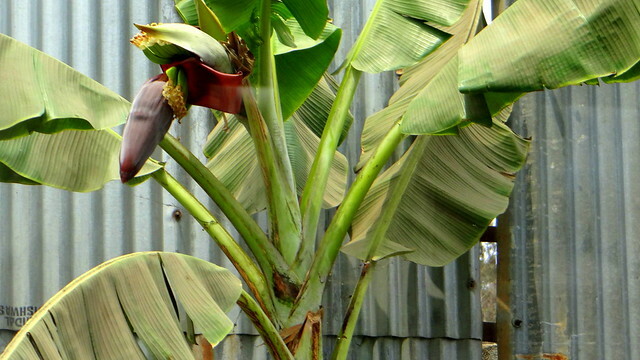 </lj-cut> In this photograph, taken before the varalakshmi pUjA, you can see both banana trees and mango leaves for sale, to decorate the goddess' mantapams in people's homes. It's a great pity that our strong links to trees seem to be getting diluted these days...and we seem to think of them not as living beings, complementing our lives, but hindrances to "development", especially to the faster flow of motorized traffic!